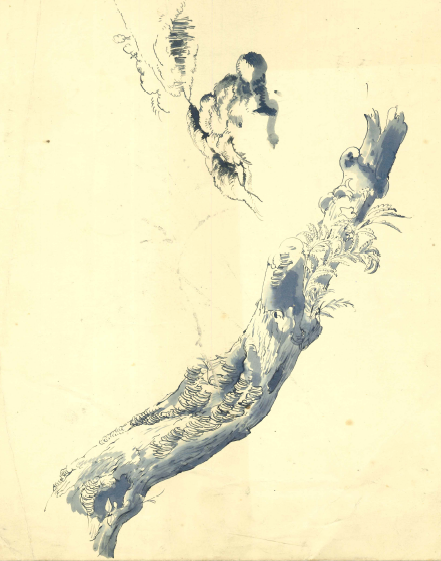 Earlier this year we bought a gorgeous album of sketches and engravings by Joan Hassall. Hassall was a celebrated English wood engraver and illustrator, and the album tells the story of one book, ‘The Collected Poems of Andrew Young’. He was Scottish, and that’s why we bought it. The album includes Hassall’s account of how the book came into existence. She knew and admired Andrew Young’s poetry, and – in 1938 – while walking near Malham in Yorkshire, saw a tree that brought his poem ‘The Old Tree’ to mind. She sketched it, and that was that for the time being. In 1946, Jonathan Cape published a collection of Mary Webb’s poems with wood engravings by Joan Hassall. The publishing company was so pleased with the book that they asked the artist if there was any other poet whose work she would like to illustrate. She suggested Andrew Young, knowing that Cape also published him. It was an attractive proposition, though Cape were quick to point out that they always lost money on poetry and couldn’t afford to pay her more than £40. Hassall was determined that the small fee should not make any difference to the number of wood engravings she would do, and Cape got something of a bargain. The album contains originals of most of the engravings in the book, which was published in 1950. In particular, there are nine different versions, or ‘states’, of that Old Tree, the largest engraving in the volume. 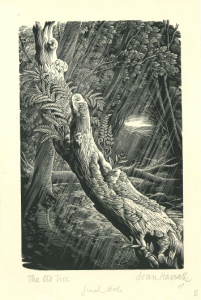 It was only after Joan Hassall had finished the engraving that she returned to the poem and “to find that the rain was pouring down all through”. Which may explain why there are so many versions. 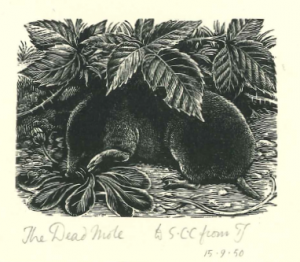 Of the smaller blocks which made up the bulk of the illustrations, Joan Hassall’s own favourite was ‘Dead Mole’. 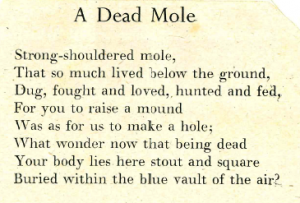 Andrew Young liked it too: “In the Dead Mole … it is extraordinary how you get the very texture of the fur”. It’s also – I think – a fine poem. Though the Library does not collect art as such, we do have a lot of it in our collections, one way or another. 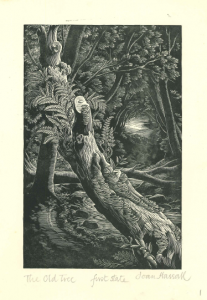 Other wood engravers whose papers we hold are Agnes Miller Parker and Iain Macnab of Barachastlain. The reference for the album is Acc.13627. Come in and have a look! Engravings used by kind permission of Simon Lawrence. ‘A Dead Mole’, from Collected Poems of Andrew Young (London: Cape, 1950).